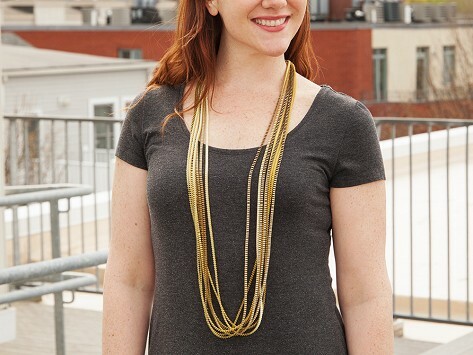 A fabric statement necklace is the best of both worlds—major visual impact, without the weight. Greek lighting designer Alexandra Tsoukala creates these necklaces with remnants from her lighting installations, using pleated strands inspired by Greek sculpture. The result is a fluid piece that catches the light and moves as you wear it—and can look different each time. This stunning museum piece necklace is unique and affordable. This paper necklace is elegant, simple and beautiful. I paid half the price with Grommet as for same one purchased in major museum gift shop.